Darmstadt, Germany, January 07, 2016 – Merck, a leading science and technology company, today announced that it has signed a collaboration agreement with Biocartis for the development and commercialization of a new liquid biopsy RAS biomarker test for patients with metastatic colorectal cancer (mCRC). The test will be developed on Biocartis’ innovative, fully automated molecular diagnostics system, Idylla™, which is designed to offer accurate and reliable molecular information from virtually any biological sample in virtually any setting. 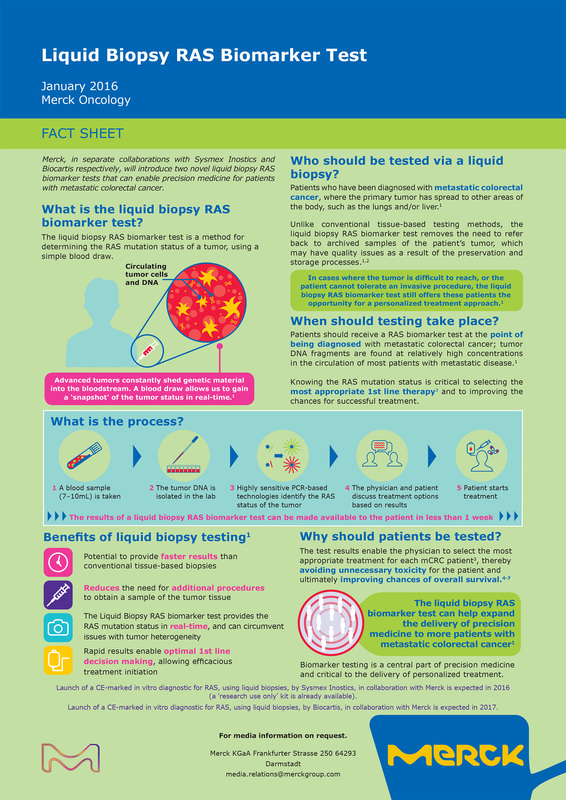 The new test aims to support clinical practice in performing integrated liquid biopsy RAS biomarker tests, independently of the laboratories’ volume of testing or level of expertise. Understanding metastatic colorectal cancer (mCRC) patients’ individual biomarker status is key to support timely treatment decision-making. The Idylla™ system is a fully automated sample-to-result PCR-based (polymerase chain reaction) molecular diagnostics system. It is designed to offer real-time, reliable and sensitive molecular diagnostic tests. Whereas most of today’s solutions only look for the most prevalent RAS mutations, the Idylla™ RAS test, comprising two Idylla™ cartridges, will be designed to detect an extended panel of RAS mutations. In addition, the new test will also provide a BRAF V600 mutation analysis directly integrated with the Idylla™ RAS test, to allow clinicians to evaluate BRAF and RAS mutation status simultaneously. Based on a direct sample of only 2 ml of blood plasma, the test aims to provide high sensitivity and ease-of-use. The test will be designed to require less than 2 minutes of hands-on time and a turnaround time of approximately 2 hours, enabling clinical decision-making in a timely manner. Merck and Biocartis plan to implement the Idylla™ liquid biopsy RAS test in numerous medical centers across the world, excluding the U.S., China and Japan. The test will be available for Research Use Only (RUO) in H2 2016 and is shortly thereafter planned to be submitted for a CE Mark. A concordance study is currently also being undertaken to substantiate the value of the test. Vaughn CP, et al. Genes Chromosomes Cancer. 2011;50(5):307−12. Douillard J-Y, et al. N Engl J Med 2013;369(11):1023–34. Schwartzberg LS, et al. J Clin Oncol 2014; March 31 [Epub ahead of print]. Available online: http://www.ncbi.nlm.nih.gov/pubmed/24687833. Last accessed January 2016. Bokemeyer C, et al. Oral presentation at the 2014 American Society of Clinical Oncology Annual Meeting, May 30–June 3, 2014. Stintzing S, et al. European Cancer Congress 2013:Abstract No:LBA17. Ciardiello F, et al. Oral presentation at the 2014 American Society of Clinical Oncology Annual Meeting, May 30–June 3, 2014. Ferlay J, Soerjomataram I, Ervik M, Dikshit R, Eser S, Mathers C, Rebelo M, Parkin DM, Forman D, Bray, F. GLOBOCAN 2012 v1.0, Cancer Incidence and Mortality Worldwide: IARC CancerBase No. 11 [Internet]. Lyon, France: International Agency for Research on Cancer; 2013. Available at: http://globocan.iarc.fr. Last accessed January 2016. Biocartis (Euronext Brussels: BCART) is an innovative molecular diagnostics (MDx) company providing next generation diagnostic solutions aimed at improving clinical practice for the benefit of patients, clinicians, payers and industry. Biocartis’ proprietary MDx Idylla™ platform is a fully automated sample-to-result, real-time PCR (Polymerase Chain Reaction) system that offers accurate, highly reliable molecular information from virtually any biological sample in virtually any setting. Idylla™ addresses the growing demand for personalized medicine by aiming to allow fast and effective treatment selection and treatment progress monitoring. Biocartis launched the Idylla™ platform commercially in September 2014 together with its first assay to identify BRAF Mutations in metastatic melanoma. Its second assay, a KRAS Mutation panel for colorectal cancer, was launched in June 2015. Biocartis is developing and marketing a rapidly expanding test menu addressing key unmet clinical needs in oncology and infectious diseases. These areas represent respectively the fastest growing and largest segments of the MDx market worldwide. Further information can be found at: www.biocartis.com. Idylla™, Biocartis’ fully automated, real-time PCR based molecular diagnostics system, is designed to offer fast and easy access to clinical molecular diagnostic information, anywhere and anytime. The Idylla™ platform covers the entire process from sample to result in a time frame of 35 to 150 minutes with less than two minutes hands-on time. Idylla™ is applicable for a wide range of clinical sample types and can analyze both RNA and DNA. The fully integrated system enables clinical laboratories to perform a broad range of applications in oncology, infectious diseases and beyond. The Idylla™ system’s first diagnostic tests, the Idylla™ BRAF Mutation Test for metastatic melanoma, the Idylla™ KRAS Mutation Test for colorectal cancer and the first infectious disease test, the Idylla™ Respiratory (IFV-RSV) Panel developed in collaboration with Janssen Diagnostics, have obtained CE-IVD marking. Further information can be found at: www.idylla.com. Erbitux® is a highly active IgG1 monoclonal antibody targeting the epidermal growth factor receptor (EGFR). As a monoclonal antibody, the mode of action of Erbitux is distinct from standard non-selective chemotherapy treatments in that it specifically targets and binds to the EGFR. This binding inhibits the activation of the receptor and the subsequent signal-transduction pathway, which results in reducing both the invasion of normal tissues by tumor cells and the spread of tumors to new sites. It is also believed to inhibit the ability of tumor cells to repair the damage caused by chemotherapy and radiotherapy and to inhibit the formation of new blood vessels inside tumors, which appears to lead to an overall suppression of tumor growth. The most commonly reported side effect with Erbitux is an acne-like skin rash that seems to be correlated with a good response to therapy. In approximately 5% of patients, hypersensitivity reactions may occur during treatment with Erbitux; about half of these reactions are severe. Erbitux has already obtained market authorization in over 90 countries world-wide for the treatment of colorectal cancer and for the treatment of squamous cell carcinoma of the head and neck (SCCHN). Merck licensed the right to market Erbitux outside the US and Canada from ImClone LLC, a wholly-owned subsidiary of Eli Lilly and Company, in 1998. Merck has an ongoing commitment to the advancement of oncology treatment and is currently investigating novel therapies in highly targeted areas. Merck is a leading science and technology company in healthcare, life science and performance materials. Around 50,000 employees work to further develop technologies that improve and enhance life – from biopharmaceutical therapies to treat cancer or multiple sclerosis, cutting-edge systems for scientific research and production, to liquid crystals for smartphones and LCD televisions. In 2014, Merck generated sales of € 11.3 billion in 66 countries.